The Guild is the UK’s biggest and most recognisable trade organisation and members of the public know that when they employ a Guild member they get peace of mind knowing that only the best can obtain membership. Members are required to prove that they have earned the right to be called master craftsmen – through the quality of their work, their commitment to customer care and the level of service they provide. Once accepted into membership they are required to maintain the Aims and Objectives of the Guild. Should they fail to do so their membership will be terminated. 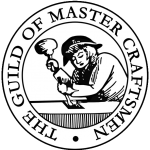 The Guild of Master Craftsman is a trade organisation. For more than 30 years The Guild has represented over 400 different crafts, trades and professions, promoting and supporting excellence. To the trade and public alike, The Guild’s emblem and Coat of Arms represent skill, integrity, quality and service. Guild members come from a wide variety of backgrounds. Some are quite unusual, such as craftsmen in wrought iron, stained glass or thatch, others are traditional builders, plumbers or electricians. A growing number are involved in newer industries such as information technology and in the retail and service sector. The one thing they have in common is their commitment to excellence. The Guild encourages members to strive for excellence and monitors standards to ensure that its principles are being maintained. I am incredibly passionate about designing, I use only the highest quality materials and everything is lovingly handmade by myself and will only leave the Lovebug Studio once it has gone through meticulous quality checks and is perfect in every way. I build a rapport with my clients and often work with them for 18 months of their wedding planning, so to be awarded membership to the Guild reiterates the quality and service that Lovebug Designs is known for.